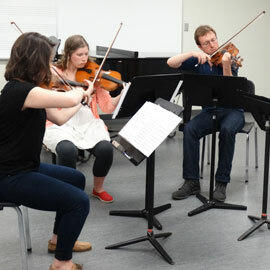 WATERLOO – Wilfrid Laurier University will welcome four young-artist quartets as part of the 24th QuartetFest May 27 to June 12 on the university’s Waterloo campus. A series of concerts and multiple chamber music workshops will be held throughout QuartetFest, a non-profit event that helps young musicians from around the world refine their talents. These aspiring professional chamber musicians will travel from across Canada and abroad to learn from some of the best chamber musicians Canada has to offer. QuartetFest offers intensive one-on-one coaching sessions to its young artists, along with an accompanying professional concert series. The five QuartetFest concerts will include performances from the QuartetFest Young Artists, the Penderecki String Quartet (PSQ), guest instructors, the Jose White Quartet, David Gillham (violin) and Chiharu Iianuma (piano), as well as a number of accompanying musicians. Friday, May 27, Maureen Forrester Recital Hall: PSQ with Leslie Fagan (soprano), Laura Pudwell (mezzo-soprano), Daniel Lichti (baritone) and Leslie De’Ath (piano). Sunday, May 29, Kitchener-Waterloo Chamber Music Society Music Room: Gallery Piano Trio, David Louie (piano) and Julie Baumgartel (violin). Thursday, June 2, Mike Lazaridis Theatre of Ideas, Perimeter Institute: PSQ, Caroline Eyck (theremin), James Mason (oboe), Gregory Oh (piano), D. Andrew Steward (karlax), Ian Whitman (bass), Omar Daniel (tesla electronics) with Sean Michaels (author). Tuesday, June 7, Kitchener-Waterloo Chamber Music Society Music Room: Jose White Quartet. Thursday, June 9, Kitchener-Waterloo Chamber Music Society Music Room: PSQ, David Gillham (violin/viola) and Chiharu Iinuma (piano). Saturday, June 11, Kitchener-Waterloo Chamber Music Society Music Room: Young Artists Concert. Sunday, June 12, Kitchener-Waterloo Chamber Music Society Music Room: Young Artists Concert. For a full listing of concerts, program details and ticket information, visit quartetfest.ca. Ticket subscriptions for all QuartetFest concerts can be purchased through the Kitchener-Waterloo Chamber Music Society (KWCMS) at k-wcms.com.